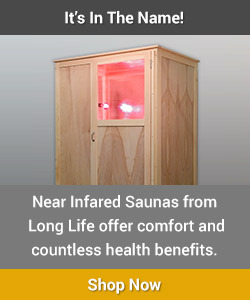 What are the Health Benefits of a Near Infrared Sauna? Every sauna has wonderful health benefits. However, Near Infrared Saunas offer the most health benefits due to the combination of near infrared light and the healing power of sauna heat. These days, the most popular infrared sauna health benefit is detoxification. The need for detoxification is self evident, and there is no shortage of articles and websites examining the levels of toxic chemicals found in people. Some of the more shocking studies find 150 or more dangerous chemicals in peoples’ blood and fat tissue. Near infrared saunas are wonderful for detoxification because when you use this sauna, you will sweat profusely. The instant heat of near infrared promotes rapid sweating and detox. Sauna detoxification is very effective when done over time. That’s why it’s so important to have a sauna in your home. It encourages you to use it more often. To effectively detoxify your body can take months of using the sauna 3-5 times a week. Sauna detoxification is much deeper and more profound than a weekend juice fast or 2 week herbal cleanse. Through sweating, you will release deeply held fat soluble toxins, water soluble toxins and heavy metals. But with a near infrared saunas, that is just the beginning. Near infrared heat easily penetrates deeply into the body. As you use these saunas, you can easily raise your core temperatures 2-3 degrees F. In doing so, the heat will gradually weaken and kill lingering or long-standing infections in the body. Increased body temperatures also stimulate a natural release of HGH, which promotes muscle growth and fat loss. Near infrared light is also a powerful anti-inflammatory agent and pain reliever. It directly stimulates energy production inside the heart of the cells, to trigger growth and regeneration of tissues. When the detoxification, heat and light are combined, a synergistic and powerful therapy is created that leads to amazing health benefits. We have seen amazing results firsthand with our sauna. We are currently not taking new orders. We plan to return in Fall 2018.